You already know the 12 Days Of Christmas, with its drummers drumming and partridges and gold rings, but we here at The A.V. Club like to take everything one step further, for your reading pleasure. Hence, 13 Days Of Christmas, a collection of essays on a handful of beloved holiday classics and a few that have sadly fallen through the cracks. Up today, an all-time Christmas-music classic. When Phil Spector was at his commercial peak as a record producer, he had his “wall of sound” style down to such a science that he could turn it over to his engineers and arrangers to do a lot of the actual work. But when Spector got it into his head to make a Christmas album, he didn’t do it by half. 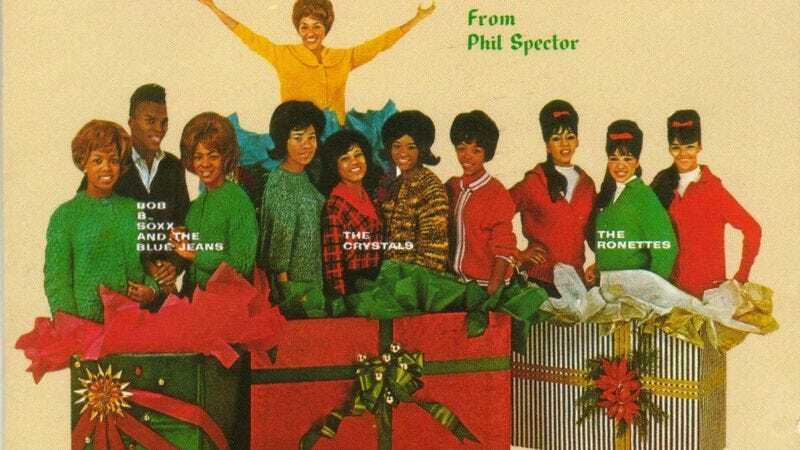 He enlisted all of the stars of the Philles label—The Ronettes, The Crystals, Darlene Love, etc.—and spent many months and many thousands of dollars making sure that every song on A Christmas Gift For You From Philles Records was perfect. Then the album came out, on the day that John F. Kennedy was killed. And it stiffed. The death of JFK is often used as a demarcation point in popular culture, signaling the end of one part of the ’60s and the beginning of another, but it’s particularly apt in the case of Spector’s career. The Beatles played The Ed Sullivan Show three months after Kennedy’s assassination, commencing a revolution in rock music that would quickly edge out Spector’s kind of grandiose teen-pop. Thankfully for Spector, The Beatles were fans and brought him into the Apple Records fold by the end of the decade. Apple then reissued A Christmas Gift For You in 1972 as The Phil Spector Christmas Album, and began the record’s rehabilitation from expensive flop to seasonal favorite. But by then, the success didn’t have the same meaning that it would’ve for Spector back in 1963, when a big hit Christmas album would’ve conferred a measure of cultural respectability. Spector couldn’t make that boast. He had stars on his Christmas album, but they were the stars he’d nurtured himself, and while they were chart-toppers, the Spector singers were looked at askance by the larger music industry because they were associated with the dandyish long-haired kid who thought he was smarter than the suits. To the establishment, Spector had dedicated his so-called “genius” to nonsense songs like “Da Doo Ron Ron,” aimed at the ever-fickle teenage-girl market. He was on the clock, as far as they were concerned, and by 1963, the major-label types felt (and not unreasonably) that Spector’s time was almost up. The beauty of A Christmas Gift For You is that it doesn’t tinker dramatically with the Phil Spector formula. If anything, it’s Spector multiplied. The songs have that big Spector beat—the relentless rush of rock ’n’ roll—and all manner of extraneous clatter. And they’ve been transformed to varying degrees into personal statements. Darlene Love’s version of “Winter Wonderland” includes a spoken-word segment that acknowledges it’s being recorded in sunny Los Angeles. “Frosty The Snowman” and “Santa Claus Is Coming To Town” are kiddie music on a sugar high, perfect for a man who’d been in the business since he was a teenager. “The Bells Of St. Mary’s” sounds almost desperate, like the “last-chance power drive” that Bruce Springsteen would later sing about on his Spector homage, “Born To Run.” The bells, horns, and strings all over this album had been a part of Christmas music long before Spector came along, but Spector super-charged them, generating a sound so exciting that rock ’n’ roll Christmas albums ever since have felt obliged to follow the lead of A Christmas Gift. Personally, I tend not to like the rockers’ version of Christmas as much as I like the ones sponsored by B.F. Goodrich. Give me Jack Jones singing about “carols at the spinet”—an old-timer nodding to even older times—and keep whatever rendition of “Little Drummer Boy” some hard-rock act knocked out in an afternoon in June for its label bosses. But I do love A Christmas Gift For You, in the same way that I love it when someone brings chili-cheese dip and beer to a Christmas party instead of candied nuts and boiled custard. The Christmas season is a time of traditions—of bringing out the tree-skirt that’s been in the family for 50 years, and dusting off your late grandmother’s hand-written gingerbread recipe—but those traditions can become oppressive if they never vary. A Christmas Gift For You brings a bit of secular modernism to the stiflingly sacred. It’s like finding a Peanuts paperback mixed in with the dry old children’s picture books that your great-aunt spreads on her coffee table at Christmas, or discovering an unexpectedly fun board game at the bottom of her old toy chest full of wooden blocks. This is doubly true of “Christmas (Baby Please Come Home),” the Love-sung Spector original (co-written with Jeff Barry and Ellie Greenwich) that has become as much of an enduring classic as the songs that Spector had his acts cover. The images of falling snow, church bells, and Christmas trees twinkling are set against Love’s lonely wailing, which takes the melancholy of holiday standards like “Blue Christmas” and “I’ll Be Home For Christmas” and amplifies it tenfold. More importantly, when Love refers to people singing “Deck The Halls,” it places “Christmas (Baby Please Come Home)” in the context of other Christmas songs, acknowledging how music defines the season as much as the smells of pine, chimney smoke, and Scotch Tape do. Good Christmas music evokes the sensations that make the holiday special. Great Christmas music becomes one of those sensations. That, indeed, is a gift.